Along came a spider...lily, that is! 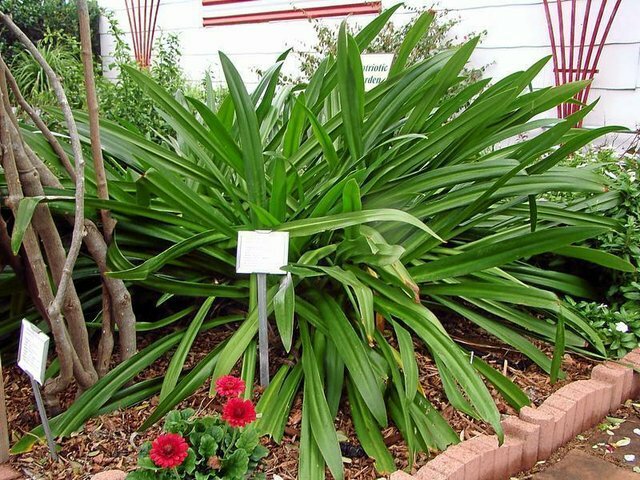 The "Tropical Giant" spider lily plant has glossy, dark green foliage year-round. Shown with it is the "spider-legged" bloom from the same plant in the patriotic mini-garden at Victoria Educational Gardens last June. This wild spider lily variety was seen in the ditch along Salem Road in Victoria County. Note the multiple stages of multiple blooms on this plant. Spider lilies can grow wild, in landscaped beds, in rock gardens, near ponds and even in containers with direct to partial sun. They prefer well-drained lightly alkaline soil with more than less moisture while in bloom. The spider lily is an easy-growing plant with characteristics of being southern because it was a tradition in the South to trade flowers with your family, friends and neighbors. Various colors and varieties of the spider lily can now be found throughout the South and southeastern United States as a result of this tradition. Its name is derived from its long, curved stamens that resemble spiders. All of the foliage is similar in each species. Some differences are the hardiness, blooming season, the size and whether they are evergreen or deciduous. There are more than a dozen species of this plant that grow well in our area because of the coastal moisture and yet are hardy despite the cold weather. Depending on the variety, spider lilies can bloom from early March until the first frost. These magical bloomers, which are all bulbs, are perennial and seem to appear in your garden and yard after a good September rain. 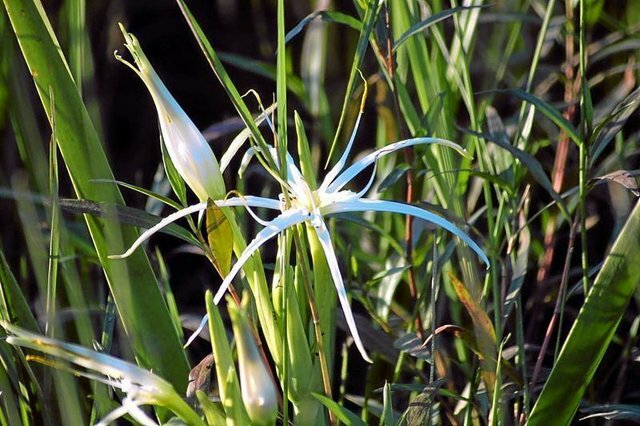 You may know Hymenocallis spp., a member of the amaryllidaceae family, by many common names such as British soldiers, Guernsey lilies and surprise lilies. This species includes the most fragrant and beautiful flower of wild bulbs. Ever noticed the red spider lilies around an old home place or in a cemetery? Makes you wonder how they got there. Story has it that that the bulbs were brought from China and Japan to the States by American sailors. They not only grab your attention, but these little lovelies are great for attracting hummingbirds and butterflies. The spider lily is practically pest- and disease-free. You may have an occasional caterpillar or slug or red patches on the leaves, but this can be associated with poor growing conditions. Try moving the plant to a sunny and warmer location for better results. Spider lilies can have real impact on your garden design. Make note of their characteristics when choosing to plant them in your garden. Before you plant, determine if you want the lilies to be an addition to your existing perennial flowers or a main focal point in your landscape. Either way, be sure to choose a sunny to partial shaded area. Remember they can produce a bloom up to 24 inches in height and depending on variety, can be as large as 3 feet across. They can adapt to a lot of soil types, but prefer a well-drained, lightly alkaline soil. Many gardeners use the spider lilies in rock gardens, as borders and even in ponds. They also can grow in containers. When you choose the perfect site for planting, take a good look at your desired garden design. Are you using the spider lilies as a "backdrop" to your shorter flowers or are you going to "clump" the bulbs? If you do decide to "clump" them for a burst of rainbow colors, remember there is no way to tell what the bulb color will be when it is time to divide and plant them the next year. 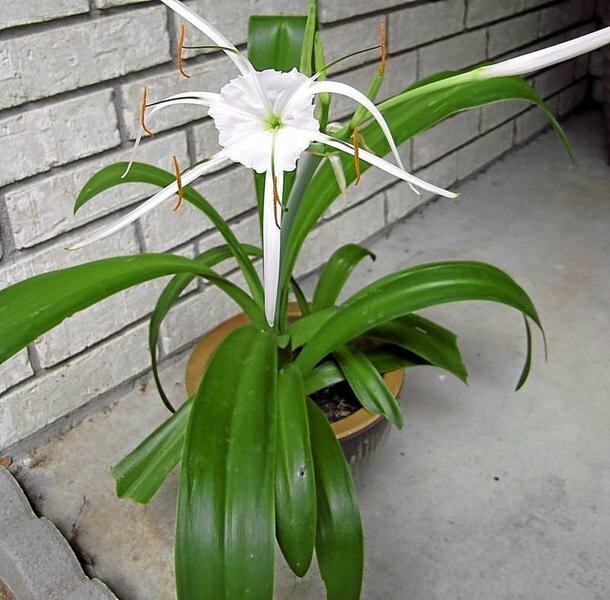 I offer a suggestion if you have spider lilies coming up in random, undesirable places in your garden or yard. Go ahead and dig them up as soon as the blooms die back, making note of their variety and color. This assists you in identifying them for planting the next time. Don't forget they can also be grown inside in a sunny window. They also can add beauty and a nice fragrance in a cut flower arrangement for your home. Spider lily bulbs can easily be dug up and divided. Separation of the bulbs should be done in summer after the foliage has died or in the fall after the blooms have faded. A single bulb can produce up to five new bulbs each year. They do very well clumped together for a dramatic burst of color or planted in a circle around your favorite tree. Plant the bulbs about 4 inches deep and 4 to 12 inches apart so that the bulbs will have space to multiply. The spider lily does well in drought periods but likes more water when in bloom. The tropical giant spider lily can be seen at the Master Gardener Victoria Educational Gardens in the patriotic mini-garden area. 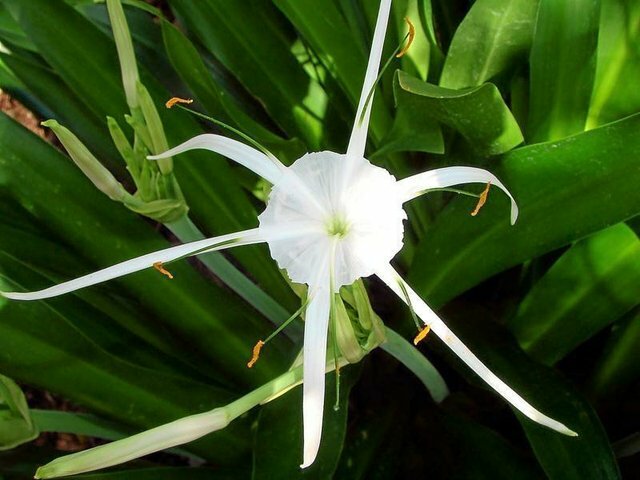 This is one of the most popular spider lilies for the Gulf coast states. It has dark glossy evergreen foliage as well as large fragrant white flowers that bloom in late June and early July. Come along to see the spider. lily, that is, for yourself at the gardens located across from the airport control tower at the Victoria Regional Airport. It's a free visit seven days a week, from dawn until dusk. The Gardeners' Dirt is written by members of the Victoria County Master Gardener Association, an educational outreach of Texas AgriLife Extension - Victoria County. Mail your questions in care of the Advocate, P.O. Box 1518, Victoria, TX 77901; or ﻿vcmga@vicad.com﻿, or comment on this column at ﻿VictoriaAdvocate.com﻿. Victoria County Master Gardener Association Symposium and Festival celebrating 10 Years of Victoria Educational Gardens will be Sept. 14 in conjunction with the Fall Plant Sale.